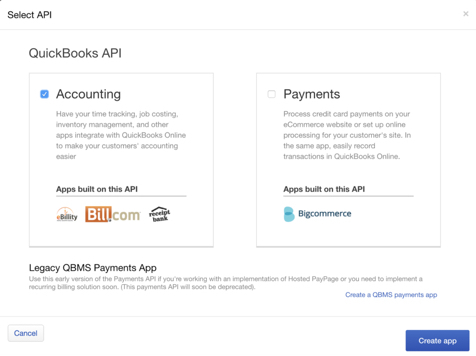 The QuickBooks Online Java SDK makes it easy to integrate your Java web app with the QuickBooks Online API. This guide assumes that you have an existing web app that you want to integrate with QuickBooks Online. Java Developer Kit (JDK) 6.0, or above, installed on your system. Your web app must use either Maven or Gradle package managers. Basic understanding of model-view-controller (MVC) architecture and the Spring Framework. For a Maven project, add the following dependencies to the pom.xml file. Make sure to use the latest version of the SDK found here. For a Gradle project, add the following dependencies to the build.gradle file. For a Maven project, add the following dependencies to the pom.xml file. Make sure to use the latest version of the SDK found here. To connect your application to a QuickBooks company, you need to create an app on the developer portal. Sign in to the developer portal and click My Apps. Select Accounting and click on Create App. To get access to the data of a QuickBooks company, a user must authorize your app through an authorization flow. At the end of the authorization flow an access token is generated, which is used to make QuickBooks Online API requests. To initiate the authorization flow, users of your app click on the Connect to QuickBooks button. This authorization flow requires the app’s Client Id and Client Secret from your app’s Keys tab. During the authorization flow, your app is redirected to Intuit’s OAuth server to get the authorization code after validating the user’s username and password. This code is sent to the Redirect URI you specified in your app’s Keys tab as shown. For this tutorial redirects users to http://localhost:8080/oauth2redirect. Set the Redirect URI in the Keys tab with the same URL. Configure the Client Id, Client Secret, and Redirect URI in your application’s property file. To initiate the authorization flow, prepare the authorization URL by specifying the required parameters for the request such as accounting scope, redirect URI, state (a unique identifier or any other information that might be useful to your application). A code snippet is shown here, refer here for full code. Initializes the OAuth2Config object by providing the clientId and clientSecret and by specifying the environment (sandbox or production) to make the API calls. Retrieves the discovery document. This is a resource that has information about the API-level properties such as an API description, resource schemas, authentication scopes, and method used to populate the URLs needed for the oauth workflow. Gathers essential parameters needed for the request such as scope, redirect URI, and csrf token (a unique identifier to your app) and prepares the authorization url to initiate the OAuth workflow. The above method uses the Spring framework for controller mapping but can be modified to match any MVC framework used in your application. After the user clicks the Authorize button, the request is sent to an Intuit server. 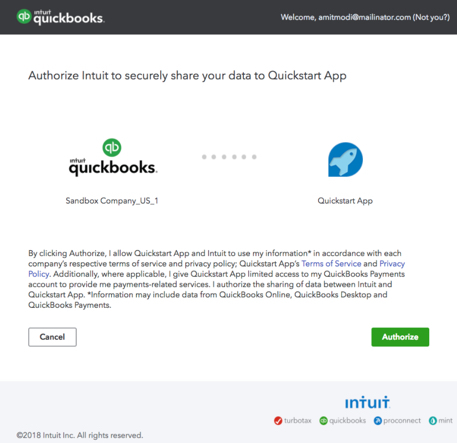 When successful, Intuit responds with an authorization code and QuickBooks Company ID (also called Realm ID) to the Redirect URI you specified earlier, for example, http://localhost:8080/oauth2redirect. The temporary authorization code returned by Intuit’s OAuth service is exchanged to obtain the access_token and refresh_token using the Token Endpoint. The access_token is used in an API request and the refresh_token is used to get a fresh, short-lived access_token after it expires. Below is a code snippet; view complete code here. Initializes DataService object by passing the realmId and accessToken. Calls the executeQuery method of the service class to get company information. Serializes the resulting companyInfo Java object into JSON. The data query can be modified to execute any QuickBooks Online API supported query as a String in the sql parameter in the snippet below. view complete code here.